Oral medicine includes Oral and Maxillofacial Medicine or Stomatology concerned with clinical diagnosis and non surgical management of non-dental pathologies affecting the orofacial region. It lies at the interface between Medicine and Dentistry concerned with the oral health care of medically complex patients - including the diagnosis and management of medical conditions that affect the oral and maxillofacial region. 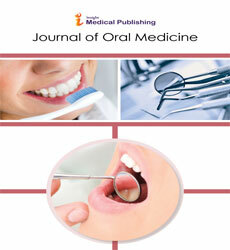 Journal of Oral Medicine is an Open Access journal includes a wide range of fields in its discipline. Scholarly open access journal aims to publish most complete and reliable source of information on the discoveries and current developments in the mode of Research articles, Review articles, Case reports, Short communications, etc. The journal is using Editorial Manager for quality peer-review process. Editorial Manager is an online manuscript submission, review and tracking system. Review process is performed by the editorial board members related field or outside experts; at least two independent reviewer's approval followed by editor approval is required for acceptance of any manuscript. Authors may submit manuscripts and track their progress through the system, completely from submission to publication. Reviewers can download manuscripts and submit their opinions to the editor. Editors can manage the whole submission/review/revise/publish process. Oral Radiographs are commonly called x-rays. Dentists use radiographs for many reasons: to find hidden dental structures, malignant or benign masses, bone loss, and cavities. Oral and maxillofacial radiology, also known as dental and maxillofacial radiology, is that specialty of dentistry concerned with performance and interpretation of diagnostic imaging used for examining the craniofacial, dental and adjacent structures. Oral Health Management, Journal of Medical and dental sciences, Oral Health Case Reports, Oral Hygiene & Health Journals, Journal of Oral and Maxillofacial Surgery, Medicine, and Pathology; International Journal of Oral-Medical Sciences, Japanese journal of oral diagnosis, Oral Radiology, European Journal of Oral Sciences, Journal of Oral Science. Oral Diagnosis, Oral Health Management, Journal of Medical and dental sciences, Oral Health Case Reports, Oral Hygiene & Health Journals, Journal of Oral and Maxillofacial Surgery, Medicine, and Pathology; International Journal of Oral-Medical Sciences, Japanese journal of oral diagnosis, Oral Radiology, European Journal of Oral Sciences, Journal of Oral Science. Oral Dentistry is a branch of medicine that is involved in the study, diagnosis, prevention, and treatment of diseases, disorders and conditions of the oral cavity, commonly in the dentition but also the oral mucosa, and of adjacent and related structures and tissues, particularly in the maxillofacial (jaw and facial) area. Oral rehabilitation is the restoration of all the teeth in mouth and it restores all the basic functions such as eating, speech, support for the lips and cheeks etc. The defective teeth are restored which is called as Oral rehabilitation. Prosthodontics which is also called as dental prosthetics or prosthetic dentistry, under the branch of dentistry. The surgery that treats the diseases, injuries and defects in orofacial and dental region. It comes under both medical and dentistry. Oral and Maxillofacial Prosthodontics Maxillofacial prosthetics (Oral and Maxillofacial Prosthodontics) is a branch of Prosthodontics that includes oral surgical and prosthodontic treatments. In this, treats the patinets who have acquired and congenital defects of the head and neck (maxillofacial) region due to cancer, surgery, trauma, and/or birth defects.